Life As It Should Be: Does Money Make the World Go Round? Some people have different ideas of happiness. To some its' material wealth and to others it may be spiritual wealth. 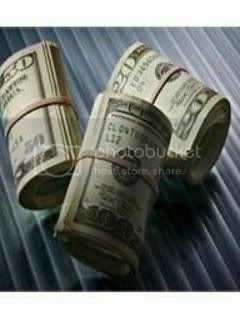 Though I think money is a factor in our happiness I don't believe its' our end all. Having money doesn't mean that every other problem that you have is erased. For instance, a wealthy person who is stressed out may take a trip to Dubai to forget about their problems, but its only temporary. They still have to come back to deal with the source. Whereas an individual who does not have the money to take such a trip may have to muddle through their issue with no source of relief. I do believe that spiritual wealth is of greater importance. To believe in a power outside of yourself which you feel is constantly guiding you and protecting you gives solace to those who don't have another outlet. I've had moments when I knew I wouldn't have made it if not for that external source. About 3 years ago I was on the I-95 on my way to Massachusetts with my boyfriend at the time. He insisted on racing everyone on the highway. At one point another driver joined the race. We were in the left lane when the car racing us decided to cut us off and in the process clipped the back of a truck ahead if him. That truck than started to flip toward our vehicle. It landed on the front of our hood and than somersaulted over us and landed behind us. Throughout this whole ordeal, and I am not making this up, I was calm. I knew in my heart nothing was going to happen to me even as I watched that vehicle flip toward us. I knew that I was protected and I felt it at that moment. People usually don't experience this belief; that there is a force protecting you, until you get into one of those situations where you know it could have gone another way and it didn't. Money may give us the comfort of a roof over our heads and clothes on our backs, but it never gives us protection from the moments we know could have turned out differently. So do I think money makes the world go 'round? Honestly its' a good thing to have, it makes me less stressed out when I have it but can I compare that to my spiritual wealth, not at all. Money doesn't get me through my tough moments, it doesn't help me to understand why certain things happen and it surely doesn't give me the comfort of protection.